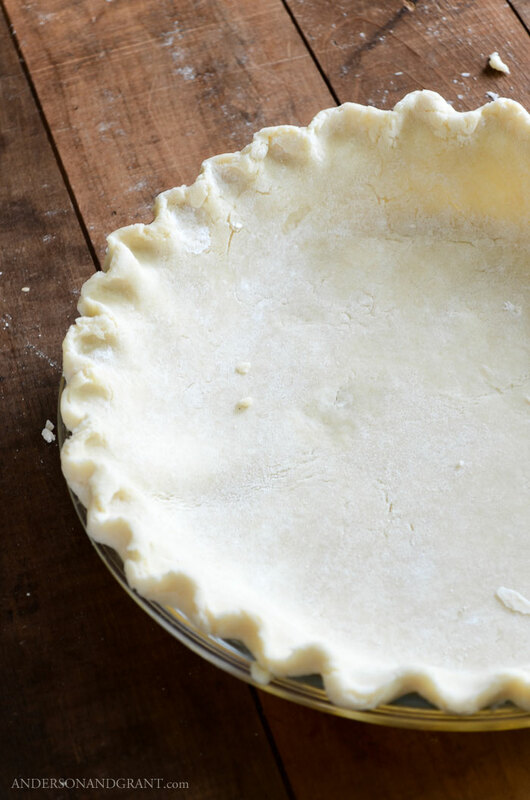 Find out how the tips you need to know to make the perfect crust for your next pie, plus get the fail-proof recipe using just a few simple ingredients. Most people either consider themselves to be great at making pie crust or think they can't do it well at all. While making crust can be tricky, your ability lies more in the recipe itself and what is done with the dough rather than any skills that you might or might not possess. There are some recipes that turn out drier than others. Some don't seem to make quite enough dough to fill the pie tin or allow enough extra to make a beautiful edge on your crust. And if the dough isn't chilled properly, it could shrink when the crust is put in the oven to bake, ruining anything decorative that was done with the pastry. After many experiments with different recipes, I believe that I may have finally found the best recipe yet for pie crust. It is fairly simple to make, rolls out nicely, and makes more than enough dough for two 9-inch pie crusts. The most important rule is to make the pie crust cold. ALL of your ingredients, not just the butter, should be cold. Before preparing this recipe you'll need to stick everything including the flour and water into the refrigerator for at least half an hour. Having everything cold keeps the butter from melting while processing. When your dough is done, you should still be able to see chunks of butter remaining. The other tip when making pie crust is to not over-mix the pastry. Process the ingredients just enough to incorporate everything, but no more. If the dough is overworked, it will get overly firm and could shrink when baked. 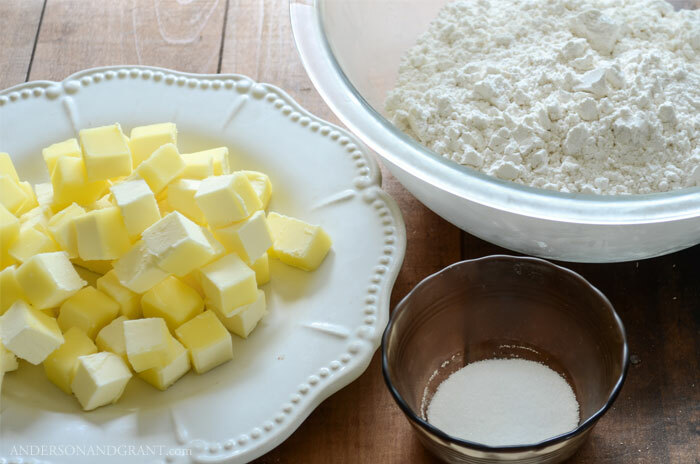 Add the flour (learn more about how to properly measure dry ingredients), chunks of butter, salt, and sugar in to a food processor. Process the ingredients until the mixture resembles coarse oatmeal. This can also be done by hand with a pastry blender. Add 1/4 to 1/3 of a cup of water very slowly and pulse the food processor a few times. The dough is ready if it holds together when squeezed but is still able to be crumbled apart. Divide the dough into two and form each half into a flat round wrapped in plastic wrap. 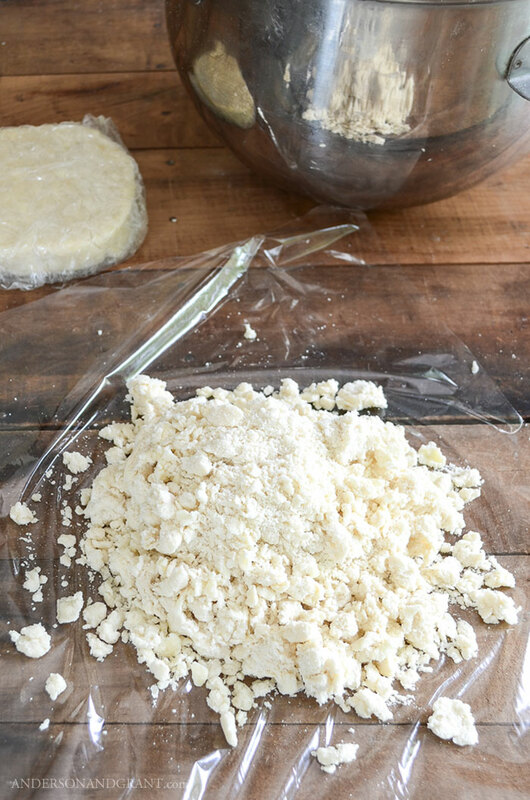 Chill the dough for at least an hour in the refrigerator before attempting to roll it out. When you are ready to make your crust, roll out the dough on a lightly floured surface. 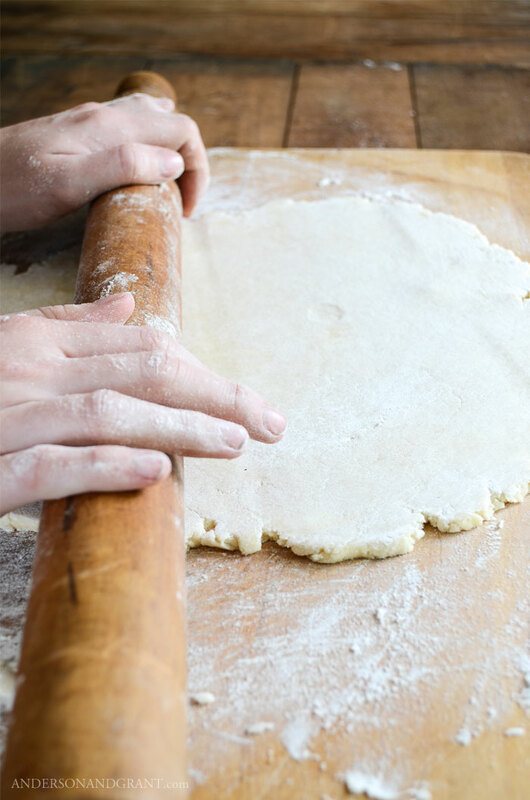 Be sure to also lightly flour the rolling pin and dough so that nothing sticks. You must keep moving the pastry around so that it doesn't stick. Also, as you roll you should apply pressure to the rolling pin in only one direction. Do not press as you roll the pin backwards. Your dough should roll out easily and maintain a round shape. If it starts to crack or break when you begin rolling, wait a minute for the dough to warm up just slightly. If it starts to stick, then the dough is too warm and needs to go back into the refrigerator. 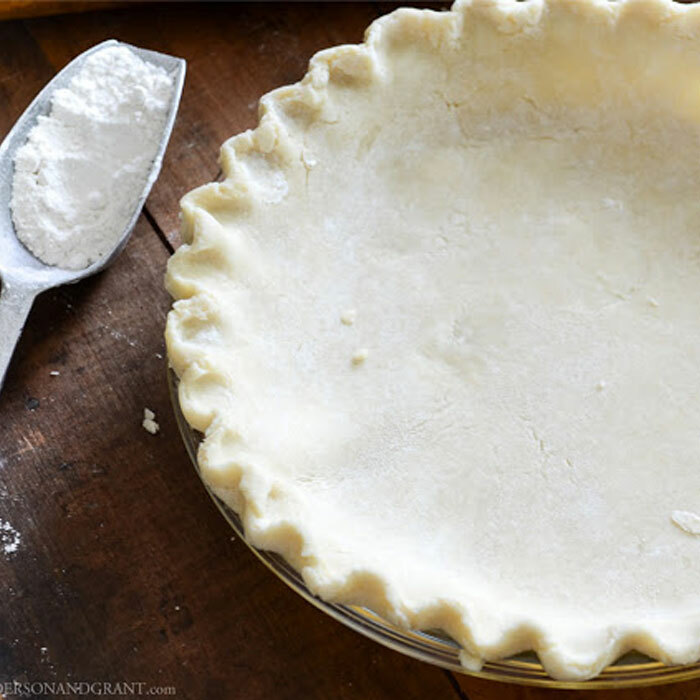 When the dough forms a circle that is a little more than an inch wider than your pie dish all around, fold it in half, and then in half again to transfer it to your baking dish without ripping. Gently press the crust down into the dish, but do not stretch it to fit. Trim the pastry around the edges with kitchen scissors to be just a little larger than the rim of your dish. Fold the excess dough under the crust to make it thicker around the edges. Use the pointer and middle finger of one hand and the thumb of your other hand to press and form a ruffled edge. 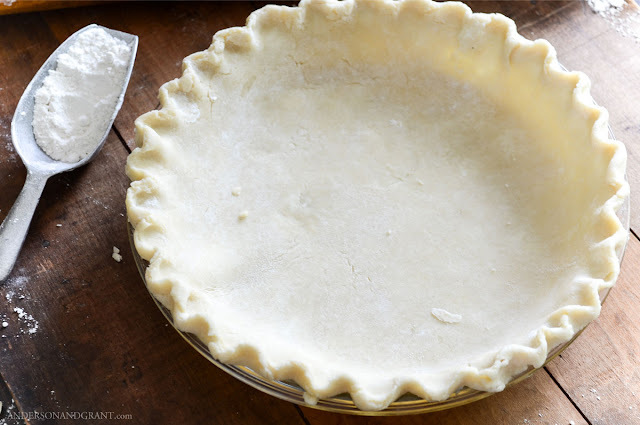 Put the crust back into the refrigerator for an hour before filling with your pie ingredients and baking. It should also be placed into the refrigerator at any point that you think the dough is getting too soft while forming the crust. And that is it! 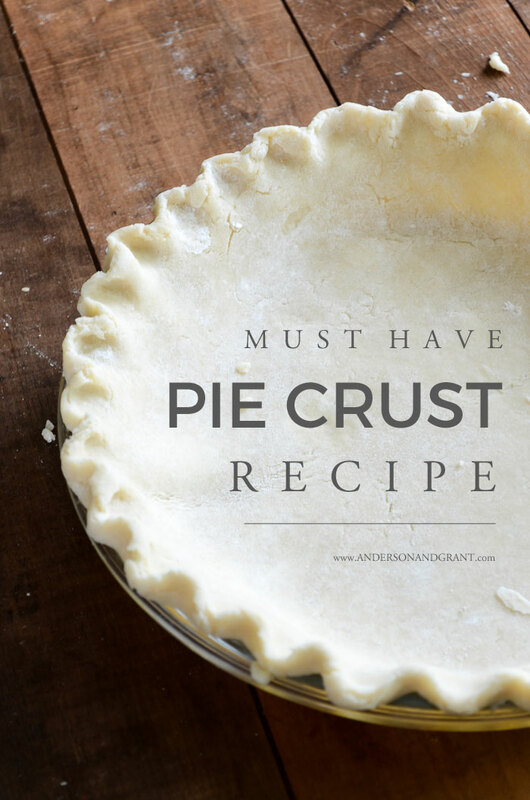 I have no doubt that you'll end up with a beautiful and tasty crust perfect for any pie! Now that you have the recipe and technique for making the perfect crust, put your skills to the test by making blueberry pie with a twisted lattice crust. It is an easy dessert you'll make again and again!